Russian-American Bengis (I Have Come Here to Be Alone, 1976, etc.) searches for spiritual roots in her parents’ native land, buffeted by tumultuous times after the fall of the Berlin Wall. Although the Cold War now seems like a receding chapter in somebody else’s history book, the casualties were real and not confined to the battlefields of Vietnam and Afghanistan. When the author went to live in Russia at the invitation of her friend “B,” she stepped into a state that, pressed to the wall by resolute capitalist antagonists, had diverted so many resources into “defense” that it became the first modern society to actually see the rate of infant mortality rise while life expectancy went down. Looking for “what socialism might have killed” in the country of her heritage, Bengis finds deep wounds and much suffering but an intact soul, true to the Russian proverb that “hope dies last.” It’s a soul personified in the turbulent B: reeling from the end of her marriage, plagued by money problems, and gripped with paranoid fear that some mobster will covet her apartment and send thugs to appropriate it, in spite of it all, she lives for art. Together B and Bengis encounter a cast of characters struggling to survive Yeltsin’s “catastroika.” (Among their late-night, kitchen-table insights is the notion that cheese from America tastes like a rubber ball.) The author’s eye for telling detail is sharp; her notions often fleeting, yet engaging—e.g., has the socialist doctrine that “everything belongs to the People” left behind it a nation of incorrigible petty thieves? The decision to have a malignancy removed in a Russian hospital puts Bengis in close contact with women facing similar surgeries; their shared, unconditional support and eventual joy at her recovery are inspirational, as the Russian spirit transcends both dreariness and angst. 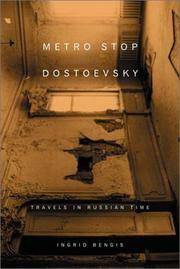 Forced literary allusions aside, a stirring encounter with people overrun by time and change.